A completely speculative image of what the transaction looked like, courtesy of History.com. 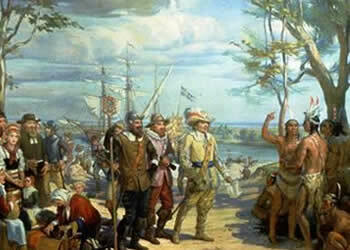 On May 6, 1626, the Dutch purchased the island of Manhattan from a local Native American tribe for $24. Or did they? There are dozens of articles online about the purchase of Manhattan, yet few paint a coherent narrative about what actually took place or properly acknowledge the limit to which we will ever be certain of key details. This is my attempt to tell the true story of how Manhattan was acquired. It gets a little messy, so I’ve conveniently added a “Too Long / Didn’t Read” section at the end. I’ll only be a little offended if you skip ahead. On May 4, 1626, Peter Minuit arrived in New Amsterdam as the new director from the Dutch West India Company. Minuit was in his early 30s, and had been sent to diversify the trade coming out of New Netherland, then almost exclusively animal pelts. Minuit means “midnight” in Dutch, so if you prefer to think of Manhattan’s purchaser as “Peter Midnight,” go for it. Lastly, there is a possibility that whoever signed the deal had a sense of the Europeans’ power, and agreed to such a deal out of fear or strategic alliance. I haven’t found any scholarly work pushing this theory, but I’m sure it’s out there, and I’m adopting it for now. In 1630, the Dutch purchased Staten Island, also for 60 guilders value. A copy of the deed explained that the supplies offered to local chiefs in exchange for unfettered right to the land included kettles, axes, hoes, Jew’s harps (an old instrument), and drilling awls, the last of which were essential for ramping up the manufacturing of wampum, the shell-beads that made up the local currency. ← Happy birthday, Nellie Bly, rock star journalist!